Tommy Hurst doesn’t at all seem frazzled, despite the fact that on this workday he has to get seven of his huge industrial-grade boilers off to Russia, there is an Alaskan Native American tribe seeking to forge a partnership with his company, Hurst Boiler & Welding, and right now there are 800 foreign employees working for Hurst at production facilities in Mexico and China. Because demand for Hurst boilers continued a four-year upward climb with nary a layoff during a downward economy that began in 2007, there are growth plans for his Thomas County plant in the immediate future. “We’re going to have to expand this facility and bring another facility in Moultrie that we left there back into the fold,” says Hurst, president of the family-owned business begun by his father four decades ago in a garage behind the family home in Thomasville. 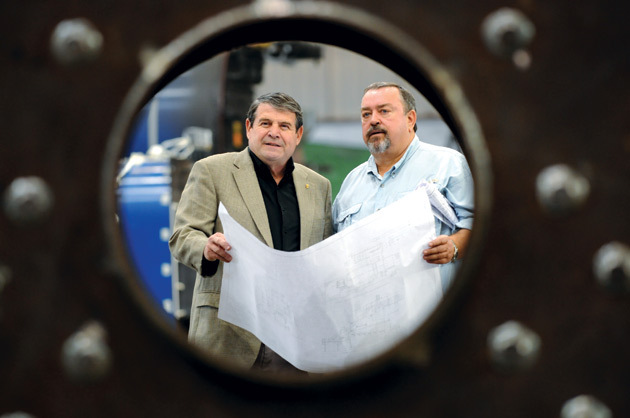 Part of the anticipated growth of his company is being fueled by the aging generations of boilers in the U.S., he says. “The American Boiler Manufacturers Association says the average life of [a] boiler [in the U.S. now] is 75 years, and they need to be [replaced] between 25 and 30 years,” Hurst says. Growth in the boiler industry can also be promoted by local conditions. “Up in Alaska, it’s because of an infestation of beetles killing trees,” he says. “They’re up there cutting down all those trees and making [energy] pellets out of them and burning them to make power and heat,” Hurst says. Thomasville’s largest manufacturer, baked goods giant Flowers Foods, provides 715 jobs for the community and has helped stimulate many more with its contributions in the downtown business and retail area, according to Karen Smith, executive director of Downtown Thomasville Main Street and Tourism. Over the years, she says, businesses had drifted in and out of the buildings. “It was really difficult to figure out what to do with those buildings,” she says. “Having a corporate citizen like Flowers step up to the plate and say, ‘Hey, we need office space, can we help with those two buildings?’” was a huge help. Flowers’ interest led to the Down-town Development Authority’s purchase of the two buildings with a lease back to Flowers and an option to buy. Today Flowers has about 180 employees working in the downtown area, adding to an already lively atmosphere there. “They’re shopping and dining and walking and helping keep the downtown vibrant,” Smith says. It’s only a short stroll east from downtown Thomasville to Warren Avenue, a part of the National Register Historic District of Tockwotton-Love Place. De-spite the “Alice in Wonderland” name, Tockwotton-Love Place has been a historic site on the National Register since the 1970s, but the Warren Avenue neighborhood had fallen into disrepair in the 1980s and ‘90s. Today, 16 homes in the working-class neighborhood of Warren Avenue have been restored to a state befitting a set for a period movie. The custodians of architectural splendor from several periods is Thomasville Landmarks, a unique preservation nonprofit dedicated to bringing significant but sickly buildings and neighborhoods back to robust health. “We operate year to year on the generosity of over 500 members in our community,” says Thomasville Landmarks Executive Director Brent Runyon. These annual contributors help with purchases of threatened landmarks, and not just those in town. When leaders in the small northwest Thomas County town of Meigs asked Landmarks to help with a complete restoration of their downtown, the preservationists came aboard in 2010 to offer technical and moral support. It seems every corner of Thomas County is alive with industry or ongoing historic preservation of some kind, including the county seat, where the 1858 courthouse is undergoing a modernization project and facelift. The major portion of Thomasville’s downtown area is divided by Broad Street, a brick-paved thoroughfare lined by period buildings holding shops, restaurants and offices. But plans have been made to bring adjacent parts of the city into the retail brotherhood. A transportation master plan is calling for a pathway to link the old and new commercial areas. Sykes says the hope is that merchants in the improved area will be motivated to freshen up storefronts or launch restoration projects to make their shops more inviting to customers. To better connect various parts of the city, a new 15-mile bike and walking trail is planned as well. “We’re putting in a trailhead that could start and end with a small amphitheater and a community water park, with active fountains kids could play in during the summer months,” Sykes says. The trail will reach to downtown public buildings, parks and other recreation facilities. “This would make for a community focal point right in downtown where all the enhancements will be taking place,” he says. Thomas County has a history of equaling or bettering the state’s unemployment numbers and per capita income levels, and its population grew by 8.1 percent over the last decade, with projections from the Governor’s Office of Planning and Budget that by 2030 the county’s population will exceed 62,000, an addition of more than 15,000 people to the present 47,000. Locals believe a good portion of that growth will come from the swelling numbers of Florida retirees arriving almost daily. But those who chart the county’s economic development patterns here are linking their comfortable stability in a volatile economy to the diversity of a manufacturing base that is as robust as any in the state, with more jobs growth forecast in that sector. The cost of living and pleasant climate in this Florida border community are part of the lure for retirees, but there is also the passion for historic preservation here. Like most of the small rural communities in Southwest Georgia, for a long time Thomasville had no public transportation for those who needed it. No one was more aware of the need for public transportation than Elaine Mays, a city employee for 23 years and now chair of the Thomas County Board of Commissioners. Mays is referring to the Rural Transit Assistance Program commonly known as the 5311 program. “Eighty percent of our money comes from the federal government, with 10 percent from the state and the other 10 percent from the [Southwest Georgia] Regional Commission,” she says. Today, with the transit system in place, that $15 trip to the local Walmart costs $1, or 50 cents for seniors. It’s not unusual for some 12,000 visitors to arrive in Thomasville during the month of April, and they’ll spend an estimated $570,000 while in town, according to data supplied by the Thomasville tourism office. Though the rose parade caps Thomasville’s annual celebration of the rose, the community has two full days of events, including the Thomasville Orchid Society’s annual Orchids on Parade show at the local library. “This town has always been about beauty: beauty in its flowers, beauty in its homes, and the kind of beauty that comes with historic preservation,” says chamber of commerce executive Sims.